Works fine so far. If you have some polygons to spare, maybe a wooden bar like in this picture is possible:http://us.123rf.com/400wm/400/400/moonb007/moonb0070806/moonb007080600009/3182248-an-old-log-cabin-fireplace.jpg? You could use the same texture that you are using for the wood. Ok, I figured you would be making the room like you are making the dungeons so it wouldn't be necessary to actually make the room walls. I'll get started on it. If it looks all right, I'll make a window like furniture that you can add wherever you want. It's not a box. One side is smaller than the other, which makes the ceiling and the floor aslope. The wall textures of the smaller walls doesn't look right. It has a strange crack in it...maybe that caused by 1. One wall is textured with the ceiling texture, not with the wall texture. OK, I'll go back over it. I grabbed something and moved it accidentally and didn't see it soon enough. Thought I had it straightened out but apparently not. I'm a little rusty. The ceiling and wall texture are the same texture, just used in a different way. There are just a floor texture and a wood panel texture. Must be something about the texture repeat I didn't see in Blender. I better use a different type of lighting. Hope it works. I put a cube up to it and tried to straighten it out that way and worked on the textures on one wall, and the woodwork was too high in a couple places. It doesn't look like that in Blender. I see you changed texture to a brick on the walls. How did you do that when it was all the same material as the woodwork and ceiling? The wood texture also doesn't look good on the beams to me. Could you post those textures, or did you with the one you showed me a while back? I'm used to using seamless textures, would that be too many? Would you rather have the woodwork as a separate object? It might be easier to work with. The woodwork might look a little nicer if it was the same as the beams, also. I'm not sure what to do about that wall. It looks like the uv's got messed up and the worst is it doesn't show in Blender. 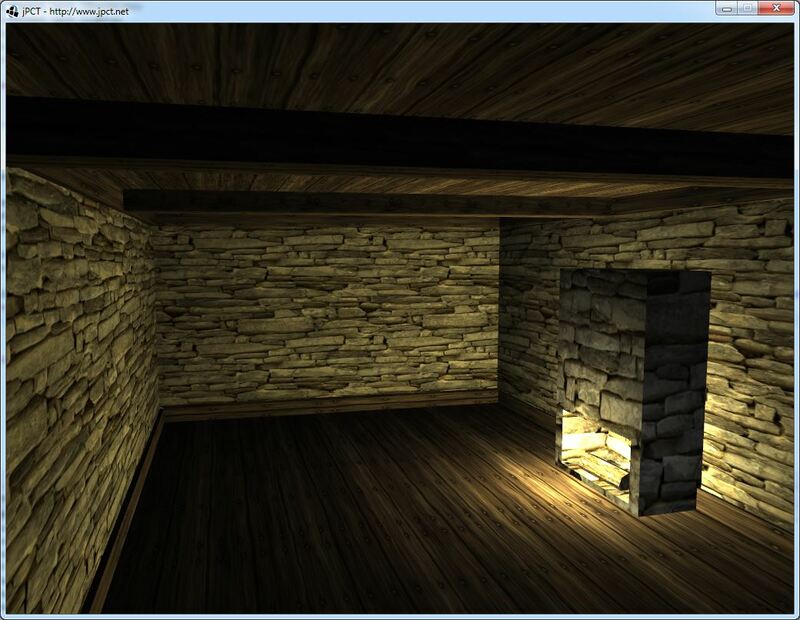 Apart from that, texturing of the ceiling looks somehow distorted. You don't really notice it in my screen shot, but if i'm using the brick texture for the ceiling, it shows up. It's not aligned to the walls like the floor texture is. OK, I'm going to rethink this. I take it you want the walls to all have one texture. The ceiling to have a separate texture. The floor to have a separate texture. 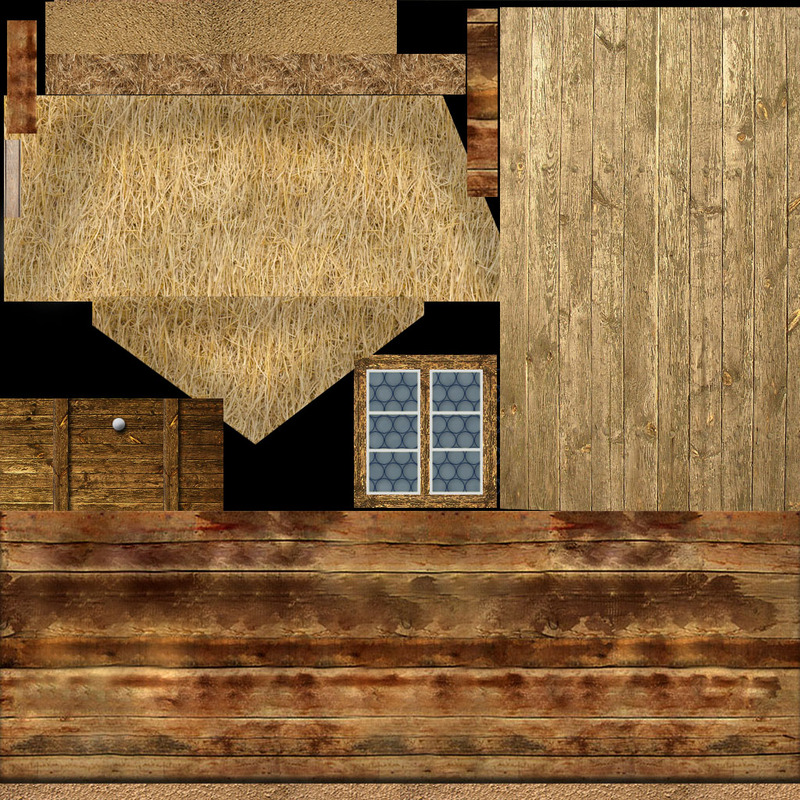 I'll use one texture on the woodwork and beams. I'll try to do the texture scaling using math so they are all the same. I'll do this by assigning different materials to those parts, which is probably what happened. Try this. I got kind of lost trying to assign materials, so I opened a new texture file when all the walls were selected and gave the ceiling a different texture altogether. I also re-scaled so they are approximately scaled the same. I think. Looks good now! I'll add it to the game when i find the time. Looks good. The fireplace should probably go to the ceiling. I can make it longer if you like. Good thing it worked because I was pretty much at the limits of my Blender knowledge, which admittedly isn't that large of a limit. I'll see if I can play around with some rustic furniture in my spare time. Maybe a table and a bench or something. Maybe a table and a bench or something. Here's a table. Let me know if it will work.